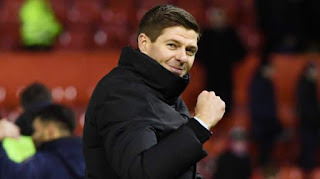 In a curious about-turn from Steven Gerrard, the manager has suggested a victory at Parkhead will turn the title race back on, while only prior to the international break he said there wasn’t one any more. True, post-match blues and emotional interviews after bad results can lead to hasty conclusions being made by those being questioned (looking at you Raymond Van Barneveld) but this is quite a change from his policy of only weeks ago. "It damages [Rangers' title aspirations] even more. Maybe [the title] was already out of reach. I don't know. You can get away with a performance like this once a season, twice if you're lucky. When you are chasing a team who have won seven trophies out of the last seven, you can't have five or six like this. It's happened three times against Hibs, once against St Johnstone and away to Dundee. Five or six times a season, good teams don't let you get away with that." It’s a diametric shift to say the least. From completely annihilating our title chances to now suggesting we have some, Gerrard is certainly not one for refusing to change his mind over some ideas, and if Rangers do manage the key victory tomorrow, we guess there’s always a slim chance? If we somehow manage a win tomorrow we would still be 7 points behind. The league is over.